The PCE-PA 8000 power analyzer is able to measure and record the power in both single-phase or three-phase circuits. With the PCE-PA 8000 power analyzer you will be able to perform prolonged measurements. Measurement values are saved in xls format in the SD card of our power analyzer in order to be easily analyzed on the computer. The measurement rate can be set from 2 to 7200 seconds. The PCE-PA 8000 power analyzer can also measure power and determine both the power factor and the phase angle. 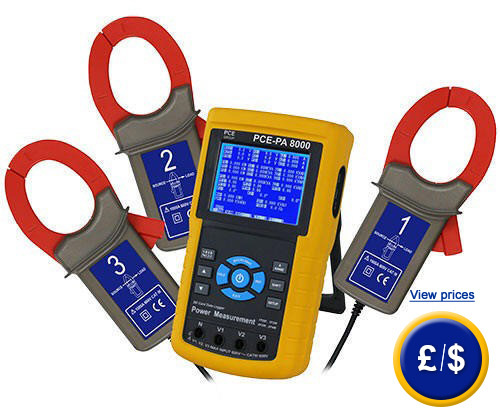 The clamps of the PCE-PA 8000 power analyzer can be used for cables with a diameter of 50 mm. The PCE-PA 8000 is the ideal tool to be used in power supply networks. Its 3.7" display allows the user to read all measured values for a quick analysis and also provides a view of the current, voltage and power. Here you will find an overview of the power analyzers that best suit your needs. Thanks to the SD card, it is possible to read measured values. Here you can see the optional accessories of the PCE-PA 8000 power analyzer. - For those companies that wish to include the PCE-PA 8000 power analyzer in their set of internal quality tool or for annual recalibration. The ISO laboratory calibration includes a certificate to meet with internal ISO quality control. The customer details also appear in the calibration documentation. - Avoid subjecting the device to extreme shocks and always handle it with care. - This device should only be repaired by qualified technicians of the PCE-Group. - Don't place the device with its display face down on a work surface to avoid damaging the keypad. - This device is not protected against exposure to dust or exposure to water. - Don't expose this device in corrosives areas or to explosive gases. - Never use the power analyser with wet hands. - Always wear a safety suit when handling the power analyser. - Before connecting the test cables or clamps, always disconnect the device first. connecting the power analyser or the clamps. - The inputs are not separated from each other. - Remove all lines being measured that are no being used by the installation. - First connect the test cable the the power analyser and then to the object being measured. - Put down the test cables with care when not being used.